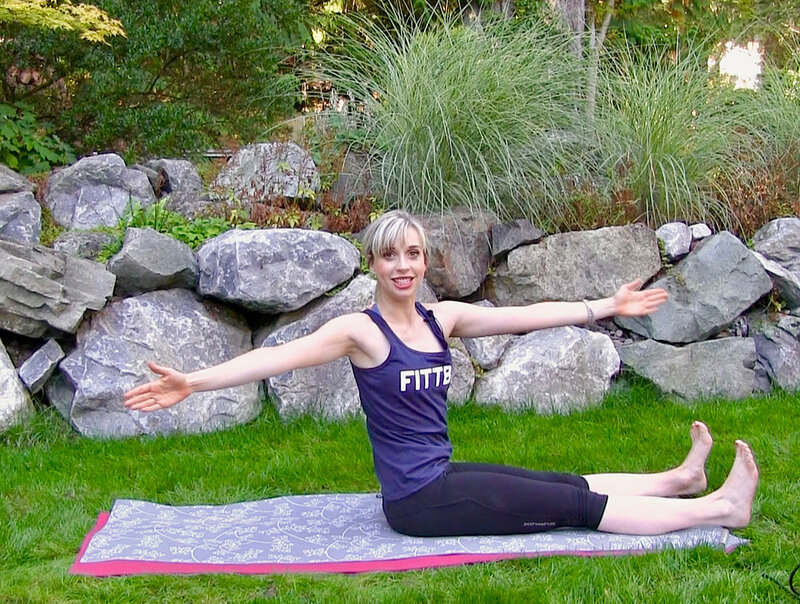 Your Spine will Smile with these 2 Pilates Exercises! Time to share our top 2 morning exercises from the Pilates repertoire - it's the Pilates roll up and oblique twists. Why we love the Pilates Roll Up. It's such a feel good spine experience. You get to roll through your spine and really stretch out. The bonus is the curve. If you allow your head to fall forward at the top, you really get a nice moment where you have a long stretch from your lower back to your upper back. -Lie on the mat with your hands arms stretched above your head. Tighten your core and now press our lower back into the mat. -Start to float your arms up (yes, like Frankenstein), and when your ams are perpendicular to your body, you want to start to curl up nice and slowly. Here we all have to fight the urge to use momentum. Pilates Roll Up with Fittbe - one of the best spine exercises! -As you continue to roll up, keep your core as tight as you can - also think of long legs! When you get to the top, you'll curve your spine. In the Fittbe apps, we often say, imagine that you are leaning over a large exercise ball! ENJOY that stretch. Now, roll completely back down through your spine, one bone at a time, and finish floating your arms back to the floor behind you. Spine twists from the Pilates repertoire are fabulous exercises for that smiling spine! -Sit up really tall on your mat, with your legs just about to the corners. It feels great to flex your feet on this one for a little extra stretch. -Float your arms out to either side, and imagine them pulling toward the walls. -Twist from your waist as much as you can to one side, and give yourself three little pulses. Twist to the other side and give yourself three more little pulses. It's a spine stretch, and oblique warm up and a treat! Let us know how you like these exercises, and be sure to check out all of your latest sessions on your Fittbe Pilates and Fittbe Barre Apps! We like to do at least 8 of these in the morning! If you've tried these exercise, be sure to let us know what you think in the comments! And, you're welcome to leave a link to your blogs too! ← Breakfast Picks for the Week!